Pin Up Perfection Magazine . 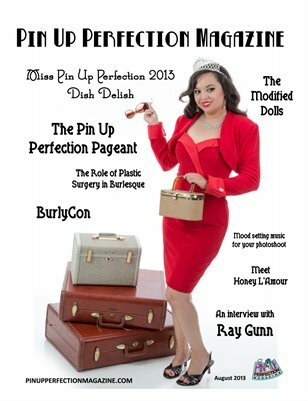 In this issue we bring you one tasty dish, the one and only Miss Dish Delish, winner of the Pin Up Perfection Pageant 2013. We also have an interview with the incomparable Ray Gunn, boylesque legend. We also find out all about BurlyCon the biggest burlesque convention around. Rowdy LeBeau shares the recipe for her Midnight Madness drink. Speaking of recipes Victoria Royale (Miss Cheesecake 2013) shares her recipe for the most amazing pumpkin cupcakes!